Project manager arrived home from work this evening and started poking about in his tool shelf, still dressed in shirt and tie. I carried on playing with the wee boys until the sighing started...then the mumbling under his breath...then the clanging of tools...Project Manager could not find the hacksaw. Over the last few years PM has bought umpteen bits of boys toys and umpteen shelves and storage units – those cute wee drawer sets that separate your nails and screws, colour coded shelves, ice-cream tubs for larger things; you get the idea. 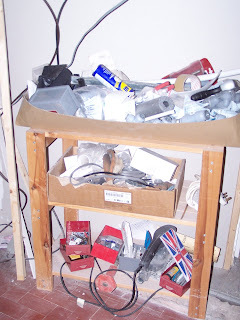 The real problem is that, in reality, the tools and peripheries get stored in two large piles – one pile on the garage work surface and one pile on a shelf in the hall. He doesn’t seem to grasp the concept that if he kept them in order and in their correct place then finding them would take a matter of minutes, in addition to the extra 10 paces to the garage in the first place. Instead, every time a job is due to start, there can be anything up to 30 minutes of searching for a critical bit of kit. Boy Toy Storage, Project Manager style! NB. The hacksaw was in the place he originally looked.